This cloud white vase makes a perfectly neutral setting for flowers in pastel hues to ones in the brightest of colors. 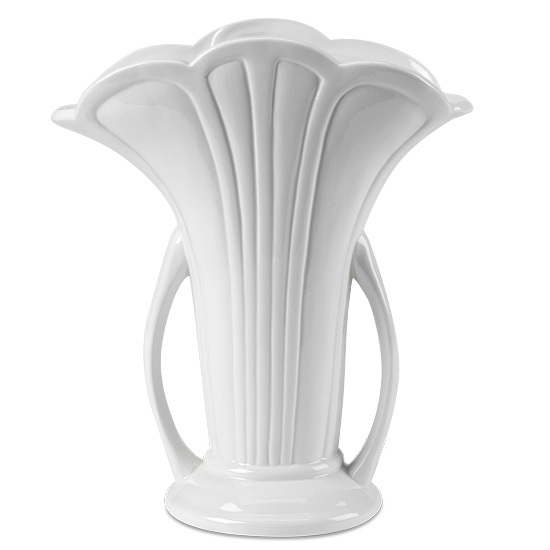 With a scalloped rim and handles, the vase allows flowers to easily fan out, letting each stem tout its own unique beauty. And, it makes a wonderful complement to practically any decor scheme. Remove all foliage that will fall below the water line on all stems. Remove the “guard petal” on each rose – this is the outermost petal left on to protect the bud during shipment. You may also remove any petals that may have slightly bruised during shipping. Hydrangeas may look a bit tired upon arrival. Don’t despair! They’re healthy – just thirsty. They will rehydrate and perk up within 24 hours. IMPORTANT! We recommend cutting all stems underwater for best blooming results. Always add fresh water daily, clean the container and change water every other day. Trim away spent blossoms as your bouquet ages and rearrange if necessary.